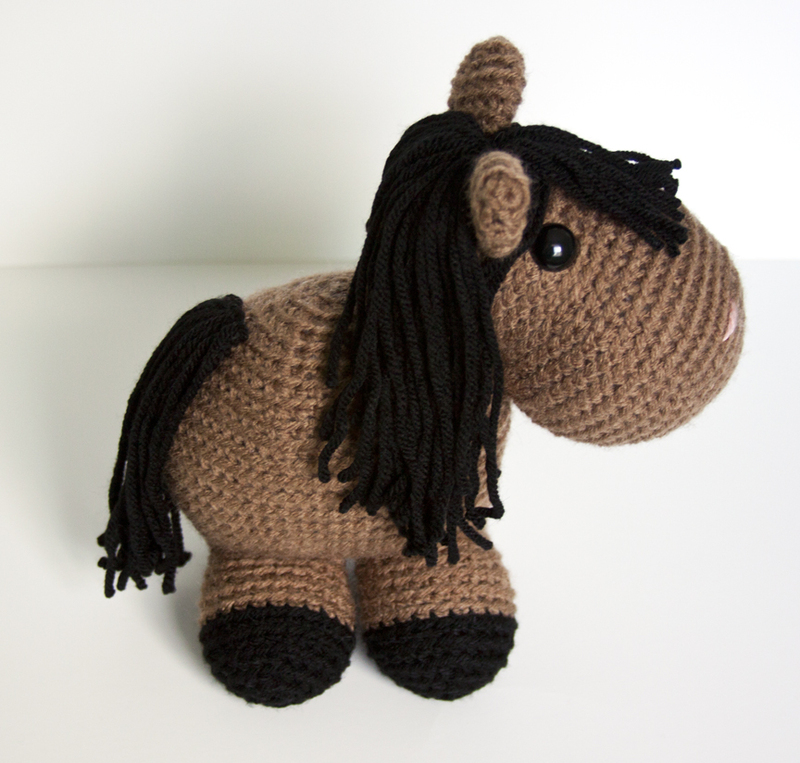 Show and Tell Meg: Crochet Update: Meet Quincy the Giddy-Up Horse! Crochet Update: Meet Quincy the Giddy-Up Horse! As you can see, when I am sick all weekend, I crochet. Not that that's very different from other weekends as I crochet a lot lol, but I do more of it when I don't feel like moving - which is how I felt most of last week. I'm finally over the worst of it, but by no means better. Anyway, I just finished this little lady up last night. Meet Quincy! Is this seriously not the cutest stuffed horse you've ever seen?! I absolutely LOVE this pattern. 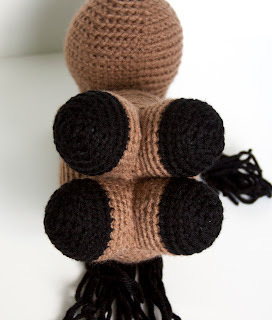 This was the first pattern released by another "online friend" of mine through Ravelry - Monster's Toy Box. 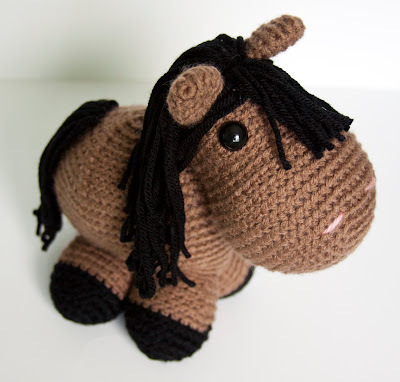 She is an awesome amigurumi maker who just started designing her own patterns. This was her first release - Giddy-Up the Horse. I instantly fell in love with that super cute face. This is another of the patterns that my sister bought me for my birthday and I couldn't wait to make it! The cool thing about the pattern is that the head and body are made as two completely separate pieces and then you sew them together. Who'da thunk? For Quincy, I used all yarns from my stash - Red Heart Super Saver in Cafe Latte for the body, Everyday Soft Worsted in black for the hair and hooves and a scrap of Bernat Softie Baby in Soft Peach for the nostrils. 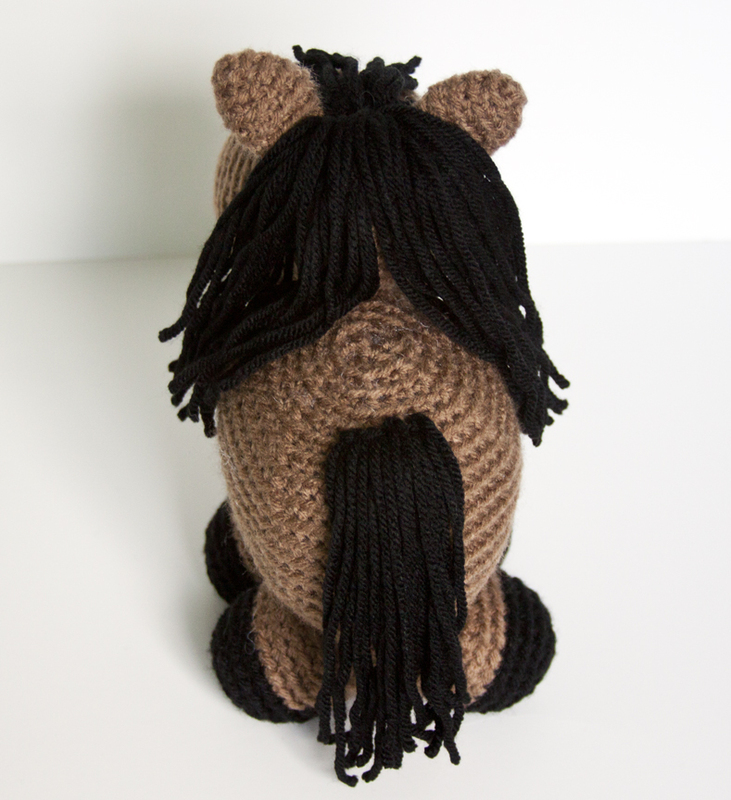 I also used 15mm eyes for my horse - a little larger than my usual 12mm ones. Each strand of the hair is put on individually! It took a little time, but honestly I was so excited to have it nearly finished that I didn't even care how long it took. It wasn't difficult at all just so you know. Another cool thing is that the legs are all joined together and then the body branches off of them. Very different from the other animals I've made where you sew on the legs. And look at that bulbous nose! The pattern does warn not to stuff the head too much or it will be too top heavy, which I was guilty of. Luckily it's just slightly off balance so I can just spread the back legs a little more and she stands up. Next time I will put some of my new polly pellets into her feet to make them heavier and avoid the problem. Another change I made was I chopped the forelock off. The pattern calls for it to be the same length as the rest of the hair, but I thought it obscured the cute face too much, so I made bangs :) I think she looks sweet. I seriously have nothing but great things to say for this pattern. I've already planned at least 2 more, so you will definitely be seeing it again in the future!